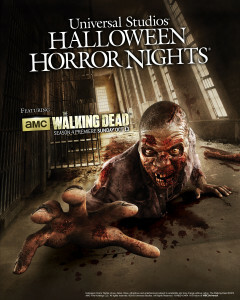 The eerily authentic and disturbingly real maze experiences will place “Halloween Horror Nights” guests at the heart of the show’s once impenetrable prison, the West Georgia Correctional Facility, now overrun by hordes of flesh-eating walkers. The mazes at Universal Studios Hollywood and Universal Orlando will send guests cowering through the walker-infested wilderness that surrounds the prison and into the seemingly utopian town of Woodbury where gruesome secrets are concealed. The Golden Globe®-nominated, Emmy® Award-winning series “The Walking Dead” is based on the graphic novel written by Robert Kirkman and published by Image Comics. The series tells the story of the months and years after a zombie apocalypse. It follows a group of survivors, led by sheriff Rick Grimes, who travel in search of a safe and secure home. “The Walking Dead” is the first original cable series ever to end the broadcast TV season as the number-one show for adults 18-49. AMC’s “The Walking Dead” returns for season 4 on Sunday, October 13 at 9pm ET/PT. For more information about “Halloween Horror Nights” at either Universal Orlando Resort or Universal Studios Hollywood, visit www.HalloweenHorrorNights.com. Watch “The Walking Dead” announcement video on Universal Studios Hollywood’s YouTube Channel, Universal Orlando Resort’s YouTube Channel, or www.amc.com. This entry was posted in Haunted Attractions, Home Page, Home Page Slider, News, Uncategorized and tagged Halloween Horror Nights Hollywood, Halloween Horror Nights Orlando, John Murdy, Michael Aiello, The Walking Dead. Bookmark the permalink.